Oklahoma doesn’t have much exotic food. However, if you look hard, you can find a somewhat authentic Italian place. There also are a couple of nice Mediterranean joints. And for some reason, we have a great selection of Vietnamese food too. But we need to take a page from New England’s handbook and get some Jewish delis. Harold’s New York Deli in Edison, New Jersey, is the perfect example of how good life can be once you leave the South. Imagine ordering a sandwich that’s stacked a foot high with nothing but meat and a couple of lettuce leaves. Imagine eating soup with a matzah ball the size of a baby’s head. You’re not dreaming. You’re at Harold’s. Harold loves you. Obviously, the giant portions are meant for an entire family to share. Though the hilariously huge skyscraper sandwich has only two slices of bread on it, there are stacks and stacks of free bread to use for building individual sandwich houses. Every time a waiter brings food to a table, you can hear the family seated there laugh in disbelief. Customers can munch upon roast beef, corned beef, pastrami and even tongue. 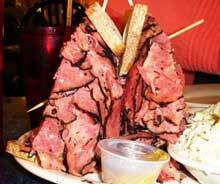 Most Oklahomans have never tasted pastrami, and have only eaten tongue in their hot dogs. They also serve big mugs filled with Birch beer which is similar to root beer, but can’t be found in Oklahoma. A New York-style deli in Oklahoma would be like an ice cream stand in the Kalahari. It would be an oasis of the good, hearty food that the Yankees in the northeast take for granted every day. The desserts are equally silly and equally yummy. Harold’s has cakes the size of a cube from a “Portal” game. For those who aren’t gamers, the cakes are the size of a ’90s computer monitor. The main appeal of Harold’s, though, isn’t even the taste of the food or the fun atmosphere. The great thing about it is how un-Olive Garden and un-Applebee’s it is. It is so refreshing. It may seem like people are too set in their ways to try anything new, but that just isn’t true. McDonalds and Pizza Hut used to be new things, too. It is time to kick the tasteless hamburgers out of our country and open ourselves to a Jewish invasion, bubbala. Harold’s — please head south.